This beautiful pedestal bowl or toh stands on an open-work, flared foot decorated with scrolling orchid motifs. The stem is embellished with a prominent collar and leads to the underneath of the bowl with border of chased scrolling foliage. The bowl itself is broad and in the form of an open lotus flower with a unadorned well. The tiered rim is finely decorated with a border of scrolling flowers and foliage. toh has an excellent patina placing the item into the nineteenth century. The silver is high-grade and thickly cast. The piece was made in several parts – the foot is secured to the plate by means of a thread and hand-cut nut. 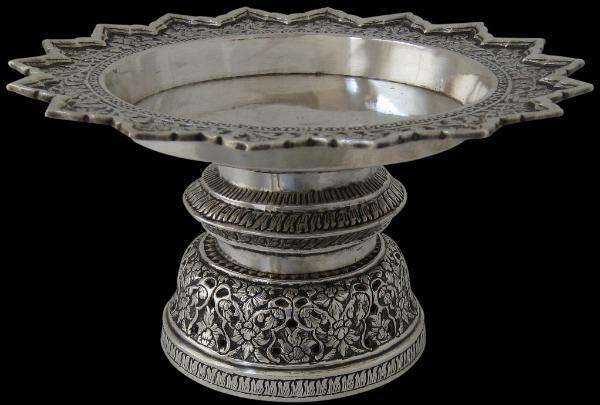 Pedestal bowls such as these were used in Thailand as offering trays for Buddhist altars in temples and in wealthier homes. 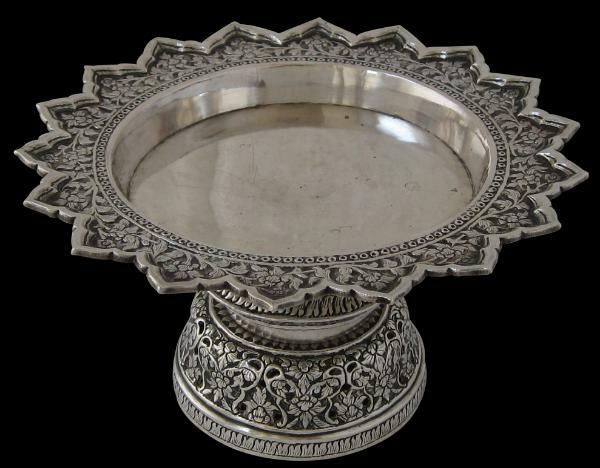 They were also used by local Muslim Malays in southern Thailand and northern Malaysia particularly as presentation platforms for gifts as part of wedding celebrations. The form is essentially Thai but the motifs also conform with Islamic strictures which enables such pieces to have cross-cultural application. This piece was acquired in the UK and this is the most probable route that it took: it was probably acquired from northern Malaysia in colonial times by a colonial administrator or similar and has been in the UK since. Overall, it is a very appealing, high-quality piece.